It was only a matter of time before I featured one of these. This is one of those vehicles that is on my "automotive wish list". I first saw a Laforza in 1989. Oddly, it was at a British car show. It was being displayed by a dealer who let me prowl around it for awhile. It didn't take long for me to realize that this was a vehicle I wanted to own. The Laforza's hefty price however, no matter how I tried to make it work, was more than I could justify paying for a car at that point in my life and it never happened. I still have the brochure he gave me. 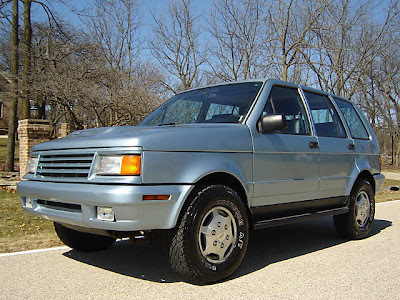 Two separate companies tried to market the Laforza in the US. Both attempts ended in bankruptcy. Designed by Tom Tjaarda, of De Tomaso Pantera fame, the Laforza was originally produced in Italy and called the Magnum. A couple of US businessmen saw the Magnum and decided that with some modifications, they could sell it as a luxury SUV. The bodies were shipped from Italy to the US, where a Ford engine and transmission along with a NP 229 transfer case (the same one used in the Jeep Cherokee) were installed. This first attempt at selling the Laforza lasted about a year before the company declared bankruptcy. Along came David Hops, a man who had made a name for himself with Monster Motorsports, a company that was dropping Ford V8s into Mazda Miatas. In 1995 Hops purchased some of the assets of the original Laforza company and started building the vehicle again on unused chassis'. (Which is why you'll often see Lafoza's using two build dates - i.e 1999 / 1989, which means the car was built in 1999 on a 1989 chassis. Although they were built in 1999, they are titled based on the chassis number, meaning that in the eyes of the DOT the vehicle is a 1989) These later Laforzas were offered in various trim levels and with a number of mechanical upgrades including a supercharged version. Hops had big plans for Laforza and for awhile it looked like Laforza was going to make it. But once again, the realities of starting an automobile company in the US set in and in 2003 Laforza was again in bankruptcy. The Laforza is a heavy SUV, weighing around 5000 lbs. It's not especially quick with the stock Ford engine, but it will get out of its own way and, for a heavy vehicle, handles very well. The body styling still looks good today and the interior is straight out of the 1980s Maserati school of interior design, with plenty of leather and wood. For what was essentially a hand built vehicle, the Laforza is remarkably trouble free. Don't expect German-style fit and finish, but it's certainly not the nightmare some small volume, hand built vehicles can be. It biggest problem is its electrical system, which, like so many other Italian vehicles from this time period, can't cope with the huge number of electrical accessories Americans require in their luxury cars. An upgrade is available and it's essential that one is installed. Radiator supports have been known to fail on earlier vehicles, but that's not too tough of a fix. For an Italian vehicle rust is not much of a problem, but check the edges of the hood and hatch. Mechanical parts for the Laforza can be found just about anywhere. Some suspension and brake parts were from Iveco and are still available. Body and trim parts are another story, but Laforza MZ (see link below) has some and may be able to source others. The Laforza is a really good SUV, one that in its time compared favorably with the Range Rover. I really thought it would do well in this country. (At one point I even owned quite a bit of stock in the - second -company that manufactured them. I had that much faith in them.) It just didn't happen. I still don't understand why. I guess that's why I don't market cars for a living. The Laforza being offered on eBay appears to be well maintained and in very good shape. The seller states that the electrical upgrade has NOT been done yet, so budget some money for that if you buy this vehicle. This is another one of those vehicles, that, if I wake up tomorrow morning and find my bank account balance and driveway 5 times the sizes they were when I went to sleep, I'd be bidding on. FYI -Contrary to a very popular myth, Laforza is in no way connected with Ferrari. But that didn't stop someone from putting a "Ferrari horse" on this Laforza. Located in Rolling Meadows, IL, click here to see the eBay listing for this 1989 Laforza. LAFORZAMZ is the only place I know of dedicated exclusively to Laforza parts and service, including the important electrical system upgrade. The website is not very useful, but there is a phone number and e-mail address listed. I had no idea that back in the mid 90's they tried again with this SUV. Styling was never to my taste, its not bad, just rather bland. However, I too have always wondered why they didn't sell more. My own own thoughts, Rugged and Italian really don't go together. I like everything about this except the color. It should be red or black. Metallic light blue doesn't do it justice. "Rugged and Italian really don't go together." --- Great line!